Clay Pot Hanger. (c) 2009 Chris Baylor licensed to About.com, Inc. When spring is approaching, and gardeners begin to get the itch to get outside in the yard and garden, many start a number of plants in the house in clay pots. Of course, once it is warm enough to set the plants outdoors, the question becomes one of whether to transplant all of the plants that have been started or leave them in the clay pots. Well, for any gardener desiring to leave some of their plants in the pots, this set of free woodworking plans is perfect. 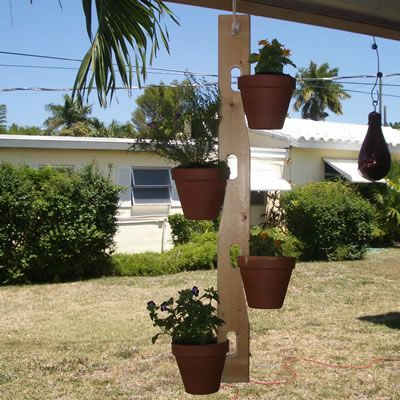 It is a hanging clay pot holder that can securely hold four clay pots of up to 8" in diameter. These four pots will simply hang in the slots you cut into the clay pot hanger, and gravity will hold them in place. Best of all, this clay pot hanger is about as simple of a woodworking project as one could devise. It is made from a single 42" piece of 1x4, and the only tools required are a drill (corded or cordless) with 1/2" and 1" diameter bits, and a jigsaw. Of course, a sander (or sheets of sandpaper) to clean up the woodwork would be a good idea, and for some, a router to ease the edges would be a nice touch, but not required. No matter how fancy you choose to make your clay pot hanger, it will securely display your clay pots in a very attractive manner, one that will show off not only your gardening skills but your prowess in the woodshop as well! Lay Out the Drill Marks and Cut Lines. (c) 2009 Chris Baylor licensed to About.com, Inc. The first and probably most important step to building this clay pot hanger is to lay out all of the cut lines and drill locations properly. If you make a mistake in laying out your marks, the cuts and holes won't align properly, and you'll likely need to start over from scratch. Each of the required marks are denoted below, but it is advisable to download and print the from step 1 to follow along. Begin with a 1x4 piece of the wood stock of your choice cut to 42 inches in length. Then, make a mark every nine inches up from the bottom, and scribe a square line at that point (perpendicular to the long axis of the board). A combination square is perfect for this task. Then, on the first and third marks from the bottom, measure in two inches from the left side of the board, and on the other two marks, measure in two inches from the right side. On each of these marks, draw a line parallel to the long axis of the board about four inches up (toward the top of the board) from the mark. Lay Out the Cut Lines. (c) 2009 Chris Baylor licensed to About.com, Inc.
Next, measure six inches down the board (toward the bottom) from the point where each square line from the previous step meets the left or right edge, and make another mark. This will denote the bottom point of an angled cut you'll layout in step 5. Now, make a mark 1-1/2 inches up from the each of the intersections of your two lines. This mark and the point where the two lines intersect will be the locations where you'll drill 1" diameter holes in the next step. There will be more layout marks to be made in an upcoming step, but not until the holes are drilled (in the next step). Drill the Holes. (c) 2009 Chris Baylor licensed to About.com, Inc. The next step of these free plans for a clay pot hanger is to drill the eight holes you placed at the layout locations in the previous two steps. Set up your cordless drill or corded power drill with a 1" diameter spade bit or forstner bit. Carefully drill a 1" diameter hole through the board at each of the eight drill hole locations noted in the previous two steps. When drilling with a bit of this diameter, be sure to secure the board in place so it doesn't catch and rotate. Also, be careful when you approach the bottom of the hole as you're drilling, so as not to blow out the back side of the hole. To learn more about how to avoid blowouts, read this article on how to drill clean holes. Finish the Cut Lines. (c) 2009 Chris Baylor licensed to About.com, Inc.
With the eight holes drilled, it is time to finish the layout lines. First, make a mark perpendicular to the long axis of the board from the bottom of each lower circle to the nearest edge. Next, using each of the pairs of holes, we'll need to mark lines to form an oval shape. Using a straight-edge, mark a line tangent to each hole on each of the sides of the two holes (once again, to form an oval). Extend the hole closest to the edge of the board down until it intersects with the perpendicular line you made in the previous paragraph. Finally, draw an angled line from the intersection of the two lines above, down to the mark six inches down the board you made in step 3. Repeat this for the other three cutout sections as well. Making the Cuts. (c) 2009 Chris Baylor licensed to About.com, Inc.
With the cut lines drawn, it is time to make the cuts. Using either a band saw or jigsaw, begin your cuts by starting at the base of the angled line and cutting upward. Try and make the cuts as straight and close to the line as possible, so as to avoid the need for straightening out the cut lines with your sander later. As you approach the top of the angled line (where it intersects with the perpendicular line tangent to the bottom hole you drilled earlier), you'll need to make a right turn. It is perfectly acceptable to round this turn with your jigsaw or band saw, as the rounding will make the cut aesthetically pleasing. After rounding that corner, your blade should ease into the bottom of the lower hole. Next, turn and make the straight cuts marked by the two lines tangent to the left and right side edges of the circles (cutting out the oval). Finally, make the horizontal cut out to the edge of the board marked by the line that is about half an inch up from the bottom of the lower hole. You may also wish to round over the inside edge of this cut, rounding it upward into the closer of the two tangent lines you just cut between the circles. With the first of the four cutouts now complete, move on to the other three and make the same cuts. When all four are finished, sand all of the cuts smooth either sanding by hand or with a random orbital sander. Drilling the Rope Hole. (c) 2009 Chris Baylor licensed to About.com, Inc. The final required woodworking step to building a clay pot hanger is to drill the rope hole. Mark the point for the drill hole centered on the board about 1-3/4" down from the top. Using your cordless drill or power drill with a 1/2" diameter bit, drill the hole at the desired location. As before, be careful not to blow out the back side of the hole with your bit, as this can cause unsightly tears in the wood that will be difficult to repair. Easing the Edges. (c) 2009 Chris Baylor licensed to About.com, Inc. This step of these free woodworking plans is optional, but it definitely adds to the look of the finished clay pot hanger. At the moment, all of the edges on the board are square. However, by using a router equipped with a 3/16" radius roundover bit with a ball-bearing guide tip, you can ease all of the edges nicely. The routing can be done free-handed, relying on the ball-bearing tip to guide you along the path, or in a router table (which is my preferred method). After easing all of the edges of the cuts and the edges of the board, sand the entire clay pot hanger by hand to clean up any marks left over by the routing. Adding the Rope Hanger. (c) 2009 Chris Baylor licensed to About.com, Inc.
With the woodworking steps to building your clay pot hanger completed, it's time to apply any finish you might want onto your hanger. You can use paint, a stain/polyurethane combination, varnish or even a lacquer finish. I would avoid shellac, as a shellac finish doesn't deal with water very well. After the finish is dried on your clay pot hanger, the last step is to attach the rope that will be used to hang the unit. You'll need a two-foot-long section of 3/8" diameter rope. Simply thread one end of the rope through the hole at the top of the clay pot hanger, and tie the two ends of the rope together, forming a big loop. You may wish to burn or singe the ends of the rope to keep it from unraveling. Using the Clay Pot Hanger. (c) 2009 Chris Baylor licensed to About.com, Inc.
To use your clay pot hanger, simply hold the hanger in an upright position (or hang the hanger by the rope in it's desired location) and attach the first pot to the hanger. Tilt the pot slightly and slip one edge of the pot into one of the holes, then ease the pot upwards until it sits comfortably in the hanger. The weight of the terra cotta pot will hold it in the clay pot hanger. Be sure to add the second pot on the opposite side of the clay pot hanger, to balance out the unit. An uneven number of pots will cause the hanger to tilt unevenly. With all four pots comfortably placed in the clay pot hanger, you may move the hanger to its final location and enjoy.